Yesterday, my Mom and I were travelling between Woodstock and Tillsonburg, Ontario. When we were near Norwich I saw a Bald Eagle flying fairly low over a farm and pointed it out to my Mom. About an hour later we were in Tillsonburg, near the Walmart store, and saw two Bald Eagles. These two were higher up, but were unmistakable as they were clearly black, with white heads and tails, which we could see well every time they slowly circled and the sun shone on them. This was on Friday, September 25th 2009, the first sighting near Norwich was at around 2:30 pm and the sighting of the two birds was around 4:00 pm and lasted for about 15 minutes, until the birds disappeared, heading south toward Lake Erie. I don't know if the bird in the first sighting was one of the pair that we was in the second sighting, but I was so pleased to have seen Bald Eagles twice in one day! Sunday July 17, 2016 we spotted a Bald Eagle in a field on Norwich Road just west of Middletown Line (west of the community of Norwich, Ontario). Last year and just a week ago. I've seen Bald Eagles on my way to Innerkip from Embro on road 33(78). My uncle has also seen them standing on a deer carcass just a few meters from the the same road. It seems like I have seen them the same time of year each time. Tuesday May 1st, 2012 saw Bald Eagle siting in the top of a dead tree on a farm on the west side of the 14th Line of East Zorra Tavistock just south of Oxford Road 33 at approximately 2:30 pm. 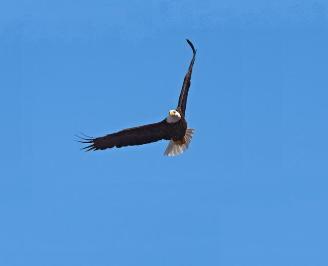 We saw a Bald Eagle in the Tillsonburg area too - we were south of Tillsonburg, not far from Vienna when we saw one flying south towards Lake Erie. We have seen them once before in that area.